Kingston Digital Europe Co LLP, the flash memory affiliate of Kingston Technology Company, Inc, a world leader in memory products and technology solutions, has announced its new Data Center 500 Series Enterprise SSDs. DC500R is optimised for read-intensive applications while DC500M is optimised for mixed-use workloads. 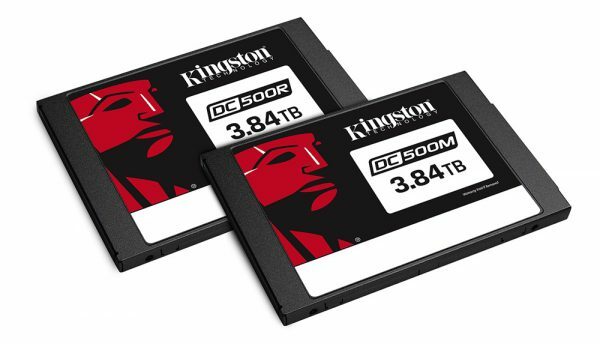 Both SSDs in the DC500 series implement Kingston’s strict quality of service (QoS) requirements to ensure predictable random I/O performance as well as predictable low latencies over a wide range of read and write workloads. DC500R is ideal for read-intensive applications such as boot up, web servers, virtual desktop infrastructure, operational databases and real-time analytics. Cloud service providers and software-defined storage architects can leverage the drive’s consistent I/O and latency performance to deliver the QoS needed in demanding read-centric environments. At .5 DWPD (drive writes per day), DC500R allows IT administrators to maximise their investment in storage hardware with a drive that delivers on performance, endurance and reliability. These workloads include AI, Big Data analytics, cloud computing, database applications, data warehousing, Machine Learning and operational databases. With an endurance rating of 1.3 DWPD, DC500M is ideal for the high-volume rack-mount server market for internal drive bay upgrades, hyperscale data centre servers and cloud service providers requiring low-cost, high-performance storage subsystems. “[A total of] 80% of all enterprise SSDs deployed in data centres require less than one (1) DWPD,” said Gregory Wong, President and Principal Analyst, Forward Insights. Tony Hollingsbee, SSD business manager EMEA, Kingston, said: “Quality of Service in an enterprise SSD is essential for cloud computing applications that require predictable storage performance levels and meet customer service level agreements. The new DC500 Series SSDs deliver excellent performance to intensive data centre applications from the development stage of the application to the end-user customer experience downstream. The Data Center 500 Series is available in 480GB, 960GB, 1.92TB and 3.84TB capacities.